It’s been quiet on the copyright front since passage of the higher education reauthorization act and the final guidelines on how it should be interpreted by campuses. For better or worse, the new law provided clear guidance on how colleges and universities are expected to address this issue. Furthermore, the music recording industry – the main driver behind the law, preceding lawsuits, and most of the press – has changed its (public) approach and moved away from many of its scare tactics. 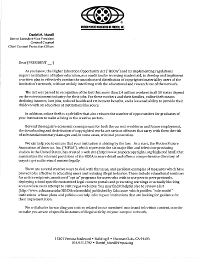 However, this morning Inside Higher Education writes about a recent letter sent to campus presidents from the movie industry (MPAA). As Steve Worona at EDUCAUSE noted, the letter largely echoes materials previously written and distributed by EDUCAUSE. But don’t be fooled; this is not a friendly letter. It’s a veiled warning and an effort to continue controlling this issue by emphasizing the copyright industry’s warped view of copyright (“theft” is used at least three times). Institutions can’t rely on the legal interpretations or “educational materials” of the copyright industry. The Department of Education is close to issuing final guidance on the recently-passed laws that require colleges and universities to take action about online copyright infringement. On Friday, August 21, the Department issues its final “Notice of proposed rulemaking.” One of the final steps in enacting a law, these proposals are the result of public hearings and internal and external discussions with representatives of the affected groups. In essence, the Department of Education is telling us how they’re going to require us to comply with the new laws and giving us all one more chance to comment. “[Develop and implement] written plans to effectively combat the unauthorized distribution of copyrighted material by users of the institutionâ€™s network without unduly interfering with the educational and research use of the network.” This plan must include (a) “one or more technology-based deterrents,” (b) a way to educate the community about copyright, (c) disciplinary procedures, and (d) assessment procedures. Periodically review the alternatives available and make the results of the review available to students. Related to the requirement that we inform students of copyright law, the Department of Education “will work with representatives of copyright holders and institutions to develop a summary of the civil and criminal penalties for violation of Federal copyright laws” that we can use in our educational efforts. That’s a curious statement and it will be interesting to see what comes of this. Many players in the copyright industry have developed educational materials and they have been uniformly dismal and incredibly one-sided. Many institutions have, of course, developed their own materials so it will be interesting to see if the Department collects materials and attempts to integrate them or how they will approach this. The idea of developing model language and materials is good but the execution is where it may get tricky. The discussion of the proposed rules makes it clear that the Department believes that institutions can and must strike a balance between combating online copyright infringement and other priorities such as network security and research purposes. Moreover, that the proposed rules give institutions some discretion in how they go about striking this balance doesn’t mean that institutions can intentionally strike a weak balance to avoid combating online copyright infringement. The discussion also briefly discusses the negotiations that took place regarding “student” v. “user.” Some sections of the proposed rule only apply to students or perspective students whereas other sections are intentionally applied to users, a much broader group of people. There was even some discussion about whether some of the provisions should be extended beyond students to include employees but the Department doesn’t make such extensions in this proposed rule. I don’t even know if the Department could make such extensions; as I understand it these proposed rules are supposed to interpret the law such that institutions can comply with the law, not go above and beyond to make new laws. DMCA notices, or (d) a commercial product designed to reduce or block illegal file sharing. The discussion in the proposed rule making says that institutions can “effectively combat the unauthorized distribution of copyrighted material using only one of the four types.” That’s an empirical claim and I would like to know how that conclusion was reached. Finally, the discussion indicates that there was significant disagreement about how institutions would be required to evaluate their copyright infringement plans. The proposed rules leave it up to institutions to determine how best to evaluate their plans, an arrangement commonly sought between the federal government and colleges and universities (“We won’t tell you what to do but you have to know and you have to be able to prove that you’re doing it well!”). the number of legitimate electronic infringement notices received from rights holders.” Unfortunately, some of those measures are plain bad. You should read the proposed rules yourself and not completely rely on what I have written. There is more in there than I discussed above and what I find interesting may not be what you find interesting or important. These rules are very far along in the process but you still have a chance to comment on them if you are so moved. I can’t imagine that comments would have much of an impact at this point but if you have something to say then please don’t let my cynicism deter you! Special thanks go to Steve, Anna, and the rest of the EDUCAUSE staff who have done such a wonderful job keeping us all updated as this legislation has moved forward. Edit: Steve Worona at EDUCAUSE has posted his overview of this document. In it, he also posts the dates and times of two programs discussing this new law that will be presented at the upcoming EDUCAUSE Annual Conference. On Friday, Feburary 6 – just over a week ago – Ruckus shut down its online music service. Napster got out of the college campus business last summer and Cdigix threw in the towel about two years ago. Unless I mistaken, this means that there are no major online entertainment services that specifically cater to colleges and universities. Let’s think about what this means for American higher education. In mid July, one of my colleagues at another institution posted to a public listserv that Ruckus has new sponsors and is changing direction.Â In particular, they no longer have a sales or marketing department which means no more posters or advertising materials sent to participating institutions. So the claims that this happened completely unexpectedly aren’t quite accurate.Â However, participating institutions and students were not given any warning (unlike when Cdigix ceased operations) that the service was going belly up last Friday so the claim isn’t completely off-base.Â And the ominous warning signs of last year are certainly cold comfort to students whose music service has suddenly ceased to be and the administrators dealing with this unexpected loss of a service. Second, let’s examine why this happened. According to interviews with The Chronicle of Higher Education, Ruckus shut down simply because it wasn’t making enough money. Fair enough.Â That’s why Cdigix and Napster both pulled out of this market. It’s not just services in this particular market that are finding it difficult to compete: TotalMusic, a service created by two of the major music publishers, appears to be having trouble just getting out of the gates. Even satellite radio service Sirius is struggling as they totter on the edge of bankruptcy. Competing with other services in this crowded market is tough, even if one ignores the unlawful services and means for obtaining music. As mentioned above, I’m a big fan of Amazon’s mp3 service and I’m sure that I’m not alone. Pandora is amazing, legal, and free (and quite popular among my friends and coworkers). MySpace is downright venerable and still a great way to discover and listen to music. There are thousands of other services. The presence of these alternative services raises the question: Exactly how much impact does the closure of these college-specific services have on students?Â I would guess that it has little direct impact as many students are likely using these other services. (Yes, I know that I shouldn’t guess as folks like Illinois State have data on students’ music listening habits and practices but I am skeptical of most data in this area as the scene changes so quickly and dramatically). But this may have a significant impact on higher education institutions and administrators. The legislation passed last year reauthorizing the Higher Education Act included provisions that require institutions to “‘effectively combat’ copyright violations with ‘a variety of technology-based deterrents’ and offer alternatives to illegal downloading.” What does it mean for us when the “alternatives” are themselves drying up and disappearing even as we’re being pushed to adopt them? What does it say about the effectiveness and viability of these services that they can’t seem to survive even when congress pushes us to adopt and support them? Finally, let’s step away from Ruckus for a moment to take in another fact of the changing landscape. The RIAA announced in December that it would not be filing new lawsuits against students. Instead, they are shifting their focus to working with Internet Service Providers to identify and warn those infringing music copyrights. So far, it appears that the RIAA is keeping its word; no new suits have been filed although ones already in process are still being litigated. In mid July, one of my colleagues at another institution posted to a public listserv that Ruckus has new sponsors and is changing direction.Â In particular, they no longer have a sales or marketing department which means no more posters or advertising materials sent to participating institutions. I have not yet found independent corroboration of these assertions. I would love to pontificate at length and offer observations but I’m afraid that there just isn’t enough information to offer much substantive, meaningful opinions other than the obvious ones: (a) it’s damn hard to compete with free and (b) your music damn well better work with everyone’s computers and mp3 players. I am, however, hopeful that the continued demise of these services will remind colleges and universities that their job isn’t to provide free or reduced music to students but to educate them. Even if students want free music and Congress pushes institutions to offer free music, institutions need to stand firm and treat students as intelligent citizens responsible for their own actions and not as captive consumers to be mollified with treats unrelated to education. Rock on, Central Michigan University! As noted by Patry, the discussion from the participants in the conference meeting that resolved the differences between the House and Senate versions of the bill is very interesting and informative. If you really want to dig into this, the relevant material can be found on page 558 of the relevant report (same document as above, same warning: long and large pdf file). Patry has copied and pasted, with comments and discussion, the relevant material on his blog if you want to avoid digging through the pdf. It looks like the bill will pass both houses and be made into law so it seems to be time to accept the inevitable and being planning on how work with or around these new laws. It may be worth taking several steps back to view the bill in its entirety as it does appear to do many good things but it’s incredibly disappointing to see once again how money influences and corrupts our legislative processes and participants. Members of the House and Senate are still wrangling over the two different versions of the bills renewing and “updating” the Higher Education Act they passed this session to bring them into harmony so they can send them to the president to sign into law. Remember that the House version includes language that would institutions to plan to install filtering or other technological measures to prevent online copyright infringement; the Senate lacks this language and only requires that institutions inform students of relevant institutional policies. About a month ago, the American Council on Education (ACE) sent a pair of letters to the appropriate chairpersons and ranking members (the chairperson is the senior member of the majority party whereas the ranking member if the senior member of the minority party) expressing support for the Senate bill’s language. ACE is the most powerful education lobbying group in the United States and they often act as a coordinating body for other groups; 12 other groups have signed on to these letters, including EDUCAUSE. The letters specifically note that “the House bill would impose new costs and regulatory burdens on both the Department of Education and campuses while doing very little to address the problem” and urge the use of the Senate language of that section of the bill. The Chronicle of Higher Education’s Wired Campus blog is doing a pretty good job covering these events as they occur so it might be worth monitoring it for ongoing coverage. Their coverage is not in-depth but it is timely. I also note that I can not recall any of the student affairs organizations – NASPA, ACPA, etc. – taking a stand on this issue.Â It may be legitimately outside of their bailiwick but I’m not entirely convinced of that given the implications for rising costs of education and the close tie this issue has always had with student discipline.Â So I’m a bit disappointed to not see any of these groups sign on to ACE’s letters.Â If my memory is too short and these groups have taken an active and public stand that I’ve overlooked or forgotten, please let me know!